Are You Still Putting Sugar in Your Coffee/Tea? If you love food and wine as much as I do, you’re probably watching how much sugar your eating. Wine has a lot of sugar and if you're going to be drinking it, you might as well get creative with your sweetener. A great way to experiment is with different flavors in a simple sugar. So instead of using the inevitable, reach for a simple syrup instead. Cocktails are far exceeding wine consumption nowadays in popularity but that's ok. 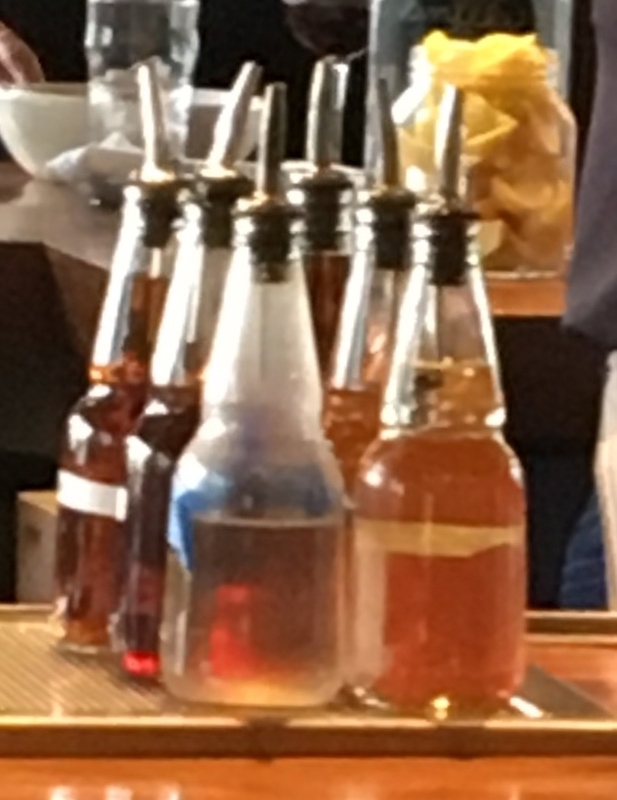 The experiments with simple syrups and all their uses are opening the doors to get creative in how you mix sugar in your drinks and foods. Save that sugar for that wine! Let cocktails grow in popularity as you put a few drops in your coffee on your way to work. As I was conjuring up a story here, one of the gals at work created a few simple syrup concoctions for the office and sure enough, I was hooked! Have you ever had Lavender Simple Syrup in your tea? It’s amazing! If you want to know how darn simple it is, here is the recipe for simple syrup. Below is a list of ingredients you can add to simple syrup or just by themselves without the sugar. There were so many variations to write about I broke them out by category. This is my short list but this can go on forever with all the different herbs there are. My number one favorite - I love this as a substitute to sweetener. I use it mostly in tea but also in ice cream, smoothies and can't wait to try this in a cake. Fresh or just about anything. I added this to a seltzer water and gave it to my sister. She was like, “ooh! This is nice! what is this?” Yes – it has few calories than a cream soda. This might be great for an elixir but also added to the bottom of your steamer for an aromatic touch to your veggies. Having a hard time with grapefruit juice? Add this flavored syrup to a ruby red grapefruit juice with a splash of seltzer and it’s amazing! Add gin and you have yourself a dainty cocktail. Add this to your water with lemon for a quick water infusion! Oh let me count the ways; desserts, teas, coffee, a hot toddy. My favorite herb although I hardly can find it - mix with a peach puree, a squeezed lemon and spritzer. Mix with lemon and whiskey and you’re cured from whatever it is you have. Do you often find your fruit going bad? Here are syrups that you can create instead of trying another water infusion. I wouldn’t think blackberries would work but with raspberries, this is a nice combination. Before both of these get bad in your fridge, why not steep them like tea to store in your fridge longer? Add to melon and pears for a beautiful fruit salad that quietly knocks all the ladies socks off at a brunch. No sugar even needed. Add in a milkshake for a true summer drink. Spiced pear syrup= ginger, cinnamon, nutmeg and pear puree as its base liquid for some fancy cocktails. Hint: the harder the pear, the better the syrup. I want to think about this one but when fresh fennel is infused with apple, it’s great for digestion. How about in a spritzer? This is beautiful in teas but of course also as wonderful in desserts – blend with one scoop of vanilla ice cream, serve in a vintage dish, and it will taste as pretty as it looks. Great mixed with pancake syrup and of course coffee. Chocolate and sugar - I'll let you take a crack at that. Whenever you see them on the bar, ask for a squirt in your coffee or tea instead of sugar packets. Maybe you won't keep a stash in your fridge but maybe you will because you like this sort of thang. Add this with Cardamom and I learned that together, these two are added in a mango lassis drink or any other exotic dish. I say, skip the sugar and let this steep for awhile for soup. However, what a great way to stir your senses in a simple syrup for your tea before starting your morning. What inbox? This would be great to add as a medicinal, which is what I did for a homeopathic tea when I was sick. I pierced peppercorns in a sliced pear and steeped it with honey and ginger and it was the only drink that cut my cough. You didn't think these would qualify? Sweet spicy and bitter for not just a spicy margarita but a kick to a dip without making it too hot. Just add a few drops at a time? Dips, salad dressing or my favorite Greyhound drink of vodka and grapefruit juice for an even better health kick. You want to add this to the fruit that you’re steeping and skip the sugar altogether. I never thought to add peppercorns into an Asian pear and boil with honey and ginger but boy did it remove my cough. If you're boiling any kind of sauces, remember to add the peppercorns and not just sprinkled over for a kick to your foods. Surprise others. This is from my friend Kathy - she was the one I wrote about in my book when we were in Korea Town. She advised me to slice an Asian pear, insert peppercorns and steep with honey and ginger. I was cured! If you thought these wouldn't go well in a shake, maybe now they do! Many people can’t seem to break the habit of adding sugar to everything even though a lot of store-bought foods or restaurants already have sugar. So you might as well take control now. The idea is to broaden your use of different foods instead of just adding sugar. This is actually a great way to experiment and add health to what your body is going to absorb anyway. Like everything else, as long as we do this in moderation, we’ll be able to continue enjoying our wine because boy, does wine sure have a lot of sugar!